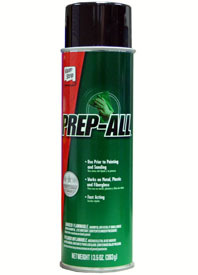 Klean-Strip Prep-All is packaged in its most convenient form when purchased as an aerosol. For full-body cleaning, and the correct prep necessary to ready your motorcycle for new paint, this 13.5oz spray can contains a high-quality cleaner that will peels off the host of substances that adhere to new and repainted bodywork. It’s designed to remove all the factory-applied mold-release coatings, packaging sealants, anti-UV agents, as well as errant fingerprints, grease and bits of the multitude of chemicals that float around your shop. Be sure to use a lint-free cloth when working with Wax & Grease Remover. This is a ColorRite-spec’d product, and like all ColorRite goods, it’s formulated to work perfectly with all ColorRite paints, and will be effective on plastics, metals and composites.